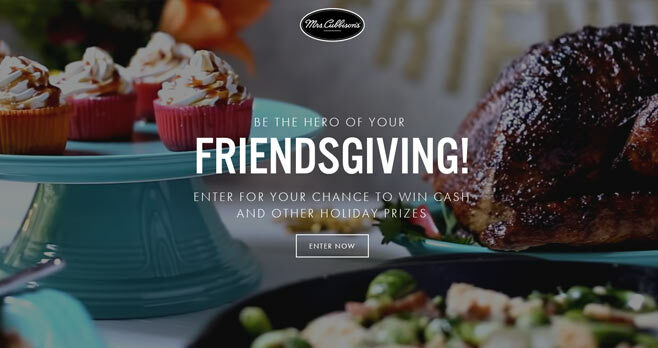 In November, visit friendsgivingtips.com and enter the Mrs. Cubbison’s Friendsgiving Sweepstakes for your chance to win a perfect holiday prize package consisting of cash and other holiday prizes. The Mrs. Cubbison’s Friendsgiving Sweepstakes is open only to legal residents of the fifty (50) United States (including District of Columbia) who are at least eighteen (18) years old at the time of entry. The Sweepstakes begins on November 1, 2018 at 12:00 P.M. Pacific Time (“PT”) and ends on November 30, 2018 at 11:59 A.M. PT. Limit of one (1) entry per person per 24 hour period during the Promotion Period. The grand prize consists of one grocery or cash gift cards totaling $500, GoodCook Prize Pack, 10 vouchers for free Mrs. Cubbison’s Products, 10 vouchers for free Challenge Butter Products. Visit www.friendsgivingtips.com to enter and see Official Rules for details.